‘Tis the season and whether you celebrate Christmas, Hanukah, Kwanza, Festivus or nothing at all, it’s had to stay away from the bad habits that accompany those two weeks in December! You may tell yourself “it’s only once a year”, but on average people gain 1-7 pounds during the holiday season. Also, they generally indulge in too much rich food, alcohol and don’t get enough sleep. And what about the stress that can surround the season? This year be good to yourself and choose a healthier way to celebrate. Be a designated driver. Not only will you be doing a good service for your friends and family, but you’ll also be skipping out on all of that wine and beer you could have been drinking. Alcohol is not only loaded with fat-causing sugars, it also deters your body from burning fat! It’s a win-win to skip out on the beverages (at least every other party!) And even if you’re not driving, try sticking to a two-drink max at holiday functions and sip water with lemon in between. Enjoy the season. 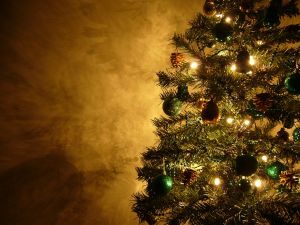 People can get caught up in the glitz, glamour and materialism of the season which can cause stress and anxiety. Try slowing down to enjoy the season by spending quality time with your family doing something fun outdoors like skating, sledding or looking at the beautiful Christmas lights in your neighbourhood. These moments will help you relax and keep your stress level in check. Put down the fork! Holiday meals can contain thousands of calories, especially when you pile on a rich dessert after. Don’t get lazy. Even if you are busy with family functions, make sure you fit in at least 20 minutes of moderate exercise a day. It’s not a lot of time but it’s enough to get your heart pumping and beat off any holiday blues. Catch some Zzz’s. It’s so important to keep up with your sleep and make sure you get your 7 hours a night. It keeps your body operating the way it should be and refreshes you for your daily dose of holiday cheer. This year make your resolution before New Year’s and stay healthy the whole holiday season! Do you want more tips on how to stay healthy this holiday season? Call us today! Thanks for all your support, guidance, hope and calm through this ongoing journey for us. This definitely would be a million more times difficult without you and your team. Thanks for making a difficult time just a little bit easier.